Did my Great Aunt Mildred contribute to the rise to power of Britain's first female Prime Minister, Margaret Thatcher? At the outset of this page, and as one who was never a fan of the Iron Lady, I must emphasise that this is pure speculation. The idea that my Aunt Mildred could have, in some way, influenced the course of history like this is something that only partly appeals! What I am certain of, is that Mildred Hooke was a pioneer in equality of education and opportunity for girls and an inspiration to the many girls who came under her influence over 40 years of teaching. But it wasn't Margaret Thatcher who came under Mildred Hooke's sway, it was someone whose politics was diametrically opposed to hers, Barbara Betts, better known as Barbara Castle! As it is a well attested view that Barbara Castle's rise to power paved the way for an acceptance of women in leadership without which it is unlikely that Thatcher would ever have become PM, hence my proposition. Without a fatal mistake in government, Barbara Castle herself could have achieved that position. Let's see if my proposition is in any way consistent with the facts. Barbara Betts, a fiery little blue-eyed redhead, stood out amongst the daughters of the wealthy wool merchants who were Liberals and Conservatives and made up most of the school's intake at a time when 80% of Bradford girls went to the mill at 14. Barbara and her sister Marjorie were daughters of Frank and Annie Betts, ardent socialists. They had long since abandoned High Anglicanism and embraced socialism as their religion, their way of life. Quoting "Barbara Castle: Politics and Power" Lisa Martineau. Kindle Edition. Buy here. Frank and Annie's socialism pervaded everything. To them 'it wasn't enough to think socialism, feel socialism and talk socialism', Barbara said, ' you had to act socialism too', by, say, setting up a soup kitchen in the house to feed miners' children during the 1920 lockout, or the 1926 General Strike; or later, after the Spanish Civil War, sheltering republican refugees, all things her parents, or rather Annie, organised (she did the work while Frank did the theory). For Barbara this practical side of socialism wasn't always easy. She felt torn, resenting, as any child might, the intrusions into her home and having to share her things, but she was proud to be a part of that kind of family. Barbara joined the ILP's Guild of Youth (Independent Labour Party) when she was 16. it was very much a social club where she learned to dance and went on rambles. She wanted to look glamorous like the stars of the silver screen and, along with her friend Evelyn Carter, she covered herself with make up and put her hair in a bob. Her brother told she looked like a tart! She was sent to the fee-paying Bradford Girls' Grammar School rather than the free secondary school. Here the curriculum was designed to secure a 'thoroughly sound, liberal education which will fit them for home life, or for entering upon any of the careers now open to women'. In 1929 Barbara and Mary attended the Independent Labour Party conference in Derby. That year she was the school's Labour candidate in the mock election to coincide with the 1929 General Election. Her campaign was highly impressive and one girl said that "she made you want to listen to her". She became head girl and later that year won a place at St Hugh's College, Oxford. Barbara stood as a Labour candidate in the school's mock election in 1929, losing badly; she polled 17 of the 600 votes. In politics guts is all, Barbara said over and over again ; as perhaps is a love of confrontation. As Clifford Allen ,the chairman of the ILP remarked, 'The revolutionary ... is the man who presents an idea to his fellow human beings which he believes to be right, in a tone of voice that will make them listen, and stands by it in a minority or majority.' Barbara was more than willing to be such a revolutionary. She liked the razor's edge; she liked the adrenaline rush that confrontation brings. Prominent in those early years was one girl who fought in the school mock election of 1929 as a Labour candidate, winning just 29 votes! 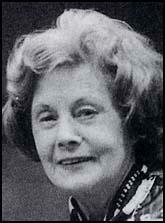 In the spirit of the school, the rebel Barbara Betts was made Head Girl and went on to St Hugh’s College, Oxford and eventually become the prominent Labour politician Barbara Castle. On a memorable visit to the school in the late 1990′s she was still able to inspire sixth form students with her fiery enthusiasm, and informative talk. In her memory the Old Girls have donated a statuette, aptly called the Red Queen, to be awarded annually to a girl who displays particular independence of spirit and mind. ... she ended up Head Girl, politically somewhat of an embarrassment perhaps, as she has always made light of it, claiming that the formidable headmistress, Mildred Hooke, was trying to turn a poacher into a gamekeeper. In my last year at school the new headmistress, Miss Hooke, astonished everyone by making me head girl. It must have been on the poacher-turned gamekeeper principle... Miss Hooke's daring gamble paid off when I won an exhibition in French to St Hugh's College, Oxford, and my name went up in gold letters on the roll of honour in the assembly hall. Was "poacher-turned gamekeeper" what my aunt was doing? I wish I had known to ask her while she was alive! it is very clear that Barbara's teenage years were very formative in her politics and her ultimate rise to become the fourth female cabinet minister in British history. No doubt, Barbara Bett's time at Bradford Girls' Grammar School, and the influence of the Head Teacher who made her Head Girl, whatever the reasons behind that decision, had a small part to play in her rise to the heights in politics and so, perhaps, paved the way, ultimately, for Margaret Thatcher!